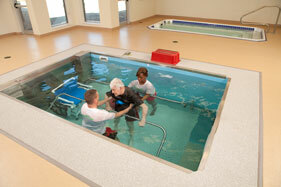 For physical therapists, the goals of rehabilitation are often driven by patient desires. Certainly, most would like to get back to their previous function, be able to perform activities of daily living and stay independent as long as possible. And sometimes, for those in a senior living community, just being able to improve endurance can make a dramatic difference. Arlington Pointe in Middletown, OH has seen the value of their HydroWorx 2000 Series pool for many skilled nursing residents and outpatient therapy patients. One resident in particular was able to increase his endurance to more than double his previous level. This patient had always had an issue with endurance, but after a recent hospitalization, the therapy staff was having difficulty even getting him back to his prior level. He expressed interest in the pool, so after clearing it with nursing, they began putting him in the pool 3 times a week. He has mild CP, stroke, diabetes, urinary issues and spasticity from the CP. He walked on the underwater treadmill and performed other exercises in the pool. He and his physical therapists noticed a dramatic difference. His endurance and posture improved so dramatically that he went from walking about 100 feet on land to about 350 after about 2.5 weeks of pool sessions 3 times a week. Cindy states that they are able to get many of their orthopedic patients walking with a more normal gait pattern because of the unweighting of the water with the treadmill. The patients are able to feel a normal gait pattern sooner than they would on land and it transitions over to land so effectively. The cameras, jets, and underwater treadmill all come into play for various patient needs. The importance of each of those features differs with every patient. The jets can be used for resistive walking, as a patient is getting stronger, to increase their progression. The underwater treadmill provides an advantage because using the buoyancy means people can walk longer distances than they would if they were just walking in the hallways. The cameras allow the therapist and patient to monitor gait patterns to ensure correct walking form.